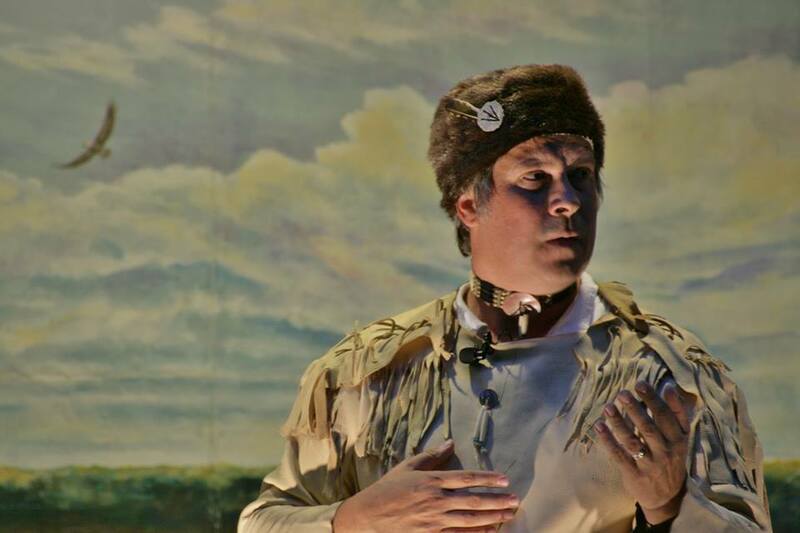 Sparks will fly in this recreation of a dramatic debate between our Territorial Governor Ninian Edwards and Potawatomi Chief Gomo on Saturday, November 17 at 2:00 pm. The program will be held in the auditorium at Cahokia Mounds. Two hundred years ago, as the original thirteen colonies were bursting at the seams, as early pioneers came flooding over the Alleghenies, and the tribes of the east were being pushed to the west, as Illinois was struggling to become a state, there were a series of events that are often left out of our history books. Yet these events were pivotal in forever shaping our state history and influencing our nation’s relations with Native Americans. From the War of 1812 to the burning of the French Village of Peoria and the Fort Dearborn Massacre in Chicago, this engaging program will challenge the audience to reconsider what they think they know about Illinois’ story. Brian “Fox” Ellis is a storyteller, author and historian. He is of Cherokee descent and strives to give voice to many of the characters left out of our history books. The performance is part of a state wide tour Retracing Edwards Trace. It is funded by Humanities Illinois and the Forgotten Illinois Grant.